After the success of the “Save the Revolution” Friday on April 1, revolutionaries have given the government one week to fulfill their demands and warned that if they don’t things will “escalate,’ next Friday. “I don’t want to reveal exactly what we are planning, but we will take matters to another level and the situation will definitely escalate,” says Amr Aly, a member of the 6th of April Movement. 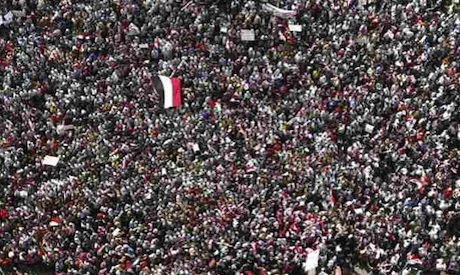 Last Friday, an estimated 100,000 protesters demonstrated in Tahrir Square. The protest was considered the first large scale demonstration since the armed forces emptied the square on March 9, followed by an anti-protest law on March 20, which banned protests, strikes and sit-ins. A subsequent call by a number of opposition movements for a million person march to protest the law on Friday, March 22, failed to gain momentum with only a few thousand protesters making it to Tahrir Square and the Radio and TV headquarters in Maspero. This led many to question if the revolution has finally lost steam. But with the appearance of thousands of protesters in Tahrir last Friday, revolutionaries feel that they are gaining the upper hand once again. Already a Facebook page calling for a million march next Friday has been set up. The page calls for a ‘Friday of Revolutionary Legitimacy,” on April 8. The group said that they demand that all local government councils are dissolved immediately, emergency law lifted, the NDP dissolved, all political detainees released and the abolishing of military trials for civilians. Add to that, says Ezzat, are the demands that the revolutionaries called for in last week’s protest, namely the prosecution of Mubarak along with his “axis of evil,” namely Zakaria Azmy, Fathi Srour and Safwat El Sherif. But most importantly, the revolutionaries no longer want the Supreme Council of the Armed Forces to run the country and demand that they hand over their power to a civilian presidential council. The groups says that if the demands are not met by the end of this week they will begin an open sit-in, perhaps a hint of what is to come. “We are calling it the Friday of Revolutionary legitimacy because the revolution has made all symbols of the old regime illegitimate and made the people decide who is legitimate and who isn’t,” explains Ezzat. “And we believe that the armed forces gets its legitimacy from the Square and if they don't fulfill the demands of the revolution this means that their legitimacy will be put to question. Indeed, the revolutionaries know that pressure works. A couple of days before the last protest the cabinet replaced key media figures, responding to one of the top demands of the revolution. On Thursday, a day before the protest El Sherif, Srour and Azmy were banned from leaving the country, although their assets have not yet been frozen. A day after the protest, PM Sharaf announced that the cabinet will revise the revilled anti-protest law. Political activist blogger Malek Mustafa says that the government’s slow response to the demands is the reason why protesters are starting to hit the streets again. “There is this saying ‘slow justice is slow injustice,’ and this is exactly what’s happening,” says Mustafa. He noted also that the significant fact that a massive demonstration was possilble, despite the Muslim Brotherhood’s refusal to join in the protest. Many opposition groups have criticized the MB for not joining the protests, with many saying that they have strayed from the path of the revolution. The brotherhood had announced prior to the protest that they won’t join in last Friday’s protest saying that they need to give the government and armed forces a grace period to fulfill all the demands, but emphasized that they will resume protesting on April 8 if the demands remain unmet. However, Hossam Tamam, an expert on Islamic movements says that he doubts that they will rejoin the revolution again. Tamam says that all the MB wanted was the freedom to form a political party, to participate in public life, which they were banned from doing during the Mubarak era, the security apparel to leave them alone and stop slamming them in prison, and free and transparent elections. But MB or not, the revolutionaries plan to soldier on. Tahrir Square, which has been glaringly empty for weeks now, was packed with tens of thousands of protesters, a sign, says Mustafa, that the revolution is once again gaining momentum. Indeed why the hesitation in dissolving known sources of political stagnation and corruption such as the local councils. Also, why the hesitation to stop emergency law and the anti-protest law. Aren't there already laws that criminalize sabotage. Seems the MB are satisfied with enough changes that stacks the chances in their favor but not anyone else. I wonder what makes most parties think that their role is to seize the government, close the doors behind them and start running their own agendas with public interest a distant second priority?